An outstanding hollowbody for jazz and old-school blues fans, which looks and sounds exquisite. Superb build quality. Impressive, flexible tones. Great value for money. Whenever Ibanez is referenced, it usually evokes thoughts of 24-fret whammy-equipped rock axes. There's a good reason for this, of course, but that's not the whole Ibanez story, though, as its first big-name signature guitarist was actually George Benson, whose GB range has enjoyed close to a 40-year lifespan. As good as these GB guitars are, though, costly signature models are out of reach for most guitarists. 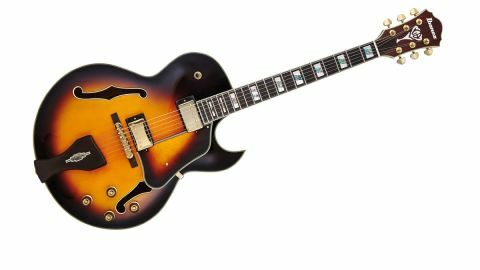 Thankfully, Ibanez recently introduced a lower-priced versions: Benson's LGB30, based on the LGB300. The origin of this guitar is quite obvious, with the LGB30 being reminiscent of Gibson's hollowbody L-5 CES and ES-175. The LGB30 (LGB means Little George Benson) sports a laminated spruce top with laminate maple back and sides. The maple's flame is subtle and looks cool and classic under the Vintage Yellow Sunburst finish. "The maple's flame is subtle and looks cool and classic under the Vintage Yellow Sunburst finish"
There's cream plastic binding around the gently curved body, and the f-holes complete the quite sumptuous vibe. Comparing dimensions with the top-line Japanese-made LGB300, the LGB30 is slightly smaller, with a body length of 495mm (19.5 inches), width of 400mm (15.75-inches) and a maximum rim depth of 92mm (3.62 inches). The 'Florentine' cutaway is substantial - more ES-175-like-pointy than L5-like-rounded, allowing good access to high frets. Powering comes from two Alnico-loaded Super 58 humbuckers, with a standard Gibson-style four-control layout, each with rubber-ribbed Sure Grip knobs. Aside from their function, as with many jazzboxes, the bridge and tailpiece are eye candy, too. The tailpiece is made from ebony with an ornate acrylic/abalone inlay that passes the strings (flatwound 0.012s) to the ART-1 bridge, which has an ebony base that's topped with a choice of either a gold-plated tune-o-matic-style bridge (with height and intonation adjustable) or an ebony top, which is included in the case, if you want to swap it for a more old-school sound. The set neck is a three-piece laminate - two outer mahogany strips and one inner piece of maple - that's topped with a bound ebony 'board, with Gibson-like 305mm (12-inch) radius, acrylic/abalone block inlays and 20 well-fettled medium-gauge frets. Topped off with a bone nut, gold tuners and a regal GB logo below the brand name, the guitar's aesthetics suggest a price that's considerably higher than it actually is. Plugged in (we used both a Fender Blues Junior and AER Compact 60), it's interesting to see how the Super 58 pickups get on. Starting with the LGB30's neck pickup, there's a rich warm tone, undoubtedly enriched by the flatwound strings. "It's simply a great hollowbody with classy 'expensive' looks and has plenty of potential in jazz, blues or Americana styles"
With volume/tone knobs maxed, there's plenty of clarity for chime-y chords or stinging single notes - a fine voice for all manner of jazz and blues. Wind back the tone control to various degrees and a roster of jazz legends springs to mind, from Wes Montgomery and Grant Green to (of course) Benson and modern Lee Ritenour. Pedals work nicely, too: vintage-style phaser or analogue chorus is perfect for early 70s fusion or early 80s R 'n' B pop. Selecting the middle position puts both pickups on. Depending on your amp settings and playing approach, there are appealing Les Paul/ES-335 tones to be had, as well as almost Tele-type, honky ones, too. There is a throaty tone that is very appealing. The bridge pickup sounds great clean, either raw or processed; add a touch of phaser and wah, and Watson's hollowbody playing with Herbie Hancock's Headhunters springs to mind. There is no shortage of f-hole guitars on the market, especially at sub £1k prices, and there's been quite a 'semi' trend over the past few years. For many, the centre-blocked semi is the do-all guitar, but that said, the LGB30 holds it own: it's simply a great hollowbody with classy 'expensive' looks and has plenty of potential in jazz, blues or Americana styles. A one-trick pony this is not.